Visit our specialist fitness store with a showroom of 366m². A high-quality home fitness machine makes you independent from the weather, the season, and any opening hours of a fitness gym. That's only one of many convincing reasons to buy a fitness equipment in Würzburg. 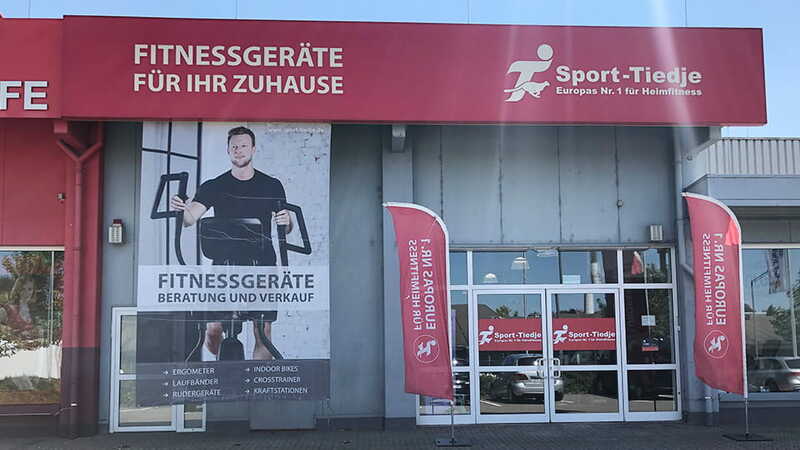 At Sport-Tiedje in the Nürnberger Straße 86, we present you on a space of 366 square metres the latest fitness equipment for a comfortable home training. Get in shape with a treadmill for the next Residence run in Würzburg and make your everyday life more active - we are looking forward to your visit! Sport-Tiedje is Europe's biggest specialist fitness store for home fitness equipment. You find a wide range of sports equipment for every fitness level and training target, from the beginner equipment to the professional machine. Multi-gyms for effective muscle building, elliptical cross trainers for a joint-gentle cardio training or high-quality rowing machines for a whole body workout. We support your sporty ambitions with the appropriate equipment. Small devices like fascia rollers, weights, and pulse monitors as well as sports nutrition complete ideally our range. How joint-gentle is the movement on an elliptical cross trainer? Which variety of exercises does a multi-gym offer? And how does it feel to work out with a rowing machine, which provides a realistic water resistance? At Sport-Tiedje in Würzburg, you do not only buy a fitness machine, you are also welcome to test it in detail. Just visit us and wear your sporty clothes and be precisely advised by our sports-enthusiastic staff. A detailed advice comes first for us, so you can find the fitness machine, which meets perfectly your requirements and training targets. Benefit from our several services like delivery, assembly, and financing as well - everything from one hand.